This is an amazing and really good looking car. It was built in Slough, with John Surtees’ collaboration uniting Japanese effort and his own, where an English Lola T90 Indy car’s monocoque was adapted by a small group of mechanics in record time from the T90 parts bin, to accept the V12 Honda powerplant. It was literally only 30 days or so (certainly less than five weeks) between agreement to build the car and when it was completed before its brief Goodwood shakedown test and then shipment by road to Monza. After a few serious but solvable practice issues, John Surtees qualified ninth and ran well until taking the lead in the last laps, fighting it out with Jack Brabham. He allowed Jack to overtake on the inside oily line and outbrake himself in the last corner (Parabolica), then Surtees was able to slip past once again to retain the lead across the line to win the RA300’s debut race. The car ran three times in 1967 and once at the start of 1968 before being replaced with the RA301 with an updated engine but importantly it wasn’t significantly lighter than the RA300 which had replaced the rather ‘heavy’ RA273. 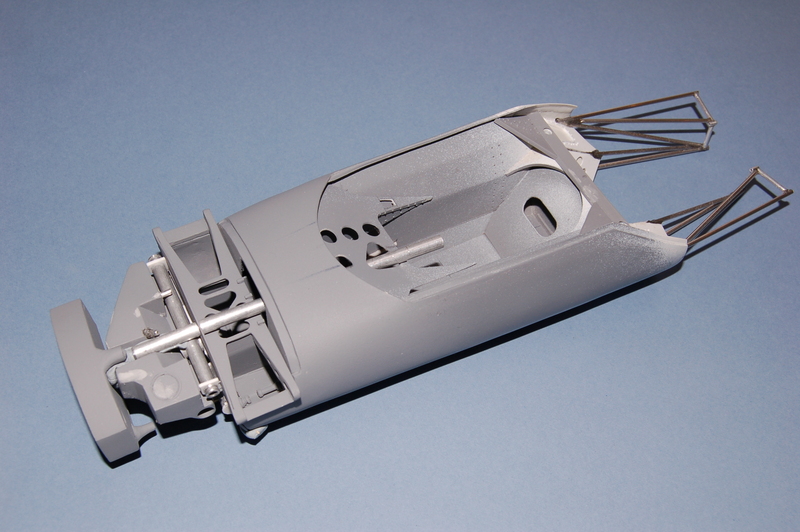 The model as currently being worked on, was started in early 2009 taking the original attempt apart (which utilised a dismantled RA273 monocoque and adapting it where possible in about 2003/4). This drastic action, followed a revitalised understanding through spending time with a LolaT90). It was whilst attending the 2008 Goodwood Festival of Speed I met Dave S from Lola and subsequently visited Lola in Huntingdon that October, in order to examine a T90 and understand the construction of the car, being interested in the monocoque forward of the firewall. Later that same day, I took in a visit to a local garage where (unbelievably in a shed) a Lola T90 chassis lay awaiting an expert spraying, in a dust free positively ventilated spray room. The purpose of that visit was to examine and measure the raw aluminium monocoque, to more accurately produce my 1/12 RA300. This story, started a long time before, most likely in 1999 when Honda brought their Formula One collection to the Festival of Speed and there I took pictures of the cars in their beautifully appointed marquee with red carpet, regularly swept clean by their white gloved, uniformed mechanics. 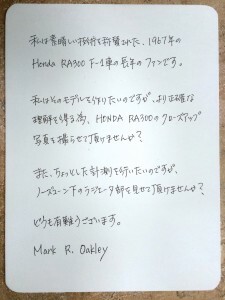 In 2001 I wrote unsuccessfully to both Lola and Honda in Japan for more information regarding the RA300. In 2003 it must have been, I decided I had to spend time alone with RA300, but how? This fabulously beautiful car came to England it seemed but once a year and for how much longer? 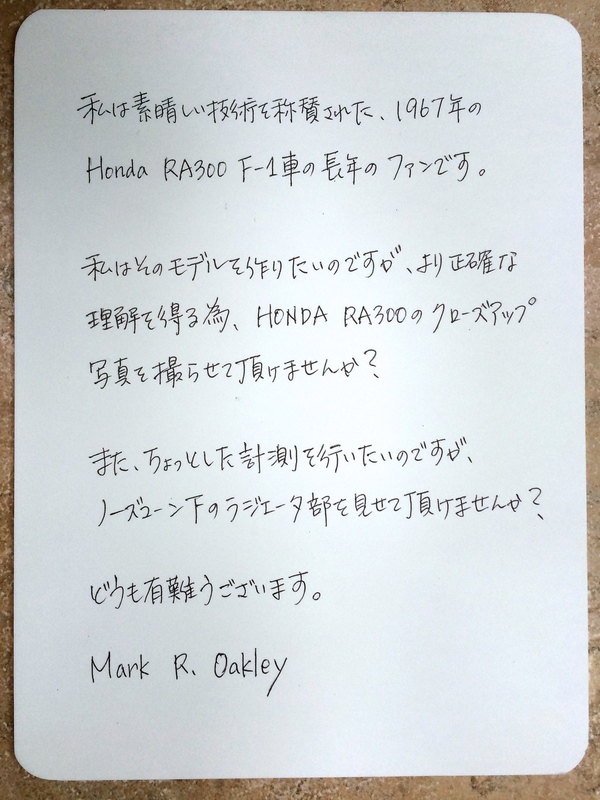 I wrote a respectful request to enjoy a private viewing of RA300 and armed with a translation in Japanese, duly turned-up at the 2003 Honda exhibit at the Festival of Speed bright and early on the Friday morning, determined. I spoke with a mechanic, but neither of us spoke each other’s language. I brought out my secret weapon and at once the charmingly sophisticated Japanese crew responded as one, to my respectful request and bubbling with enthusiasm I was let under the rope into ‘automotive heaven’, if I dare use that phrase; for real heaven, with the God himself and the Lord Jesus Christ, will be far more wonderful than even this! So in 2003 and 2005, having made acquaintance with the Chief Engineer (Y.I. ), I risked potential embarrassment (but who cared, during this opportunity of a life time), sprawled over the red carpeted floor whilst taking every conceivable measurement and photograph, in order to draw up a minimal ‘instruction manual’ for the RA300. The crowd several deep, photographed and videod from over the rope whilst the RA300 was laid bare and on one occasion, a veterinary client of mine (Tony), even telephoned me to challenge my shyness and to get me to look up and give him a wave. We corresponded and from Japan Y.I. would send his answers and photos in 2004 and my feel for the construction of RA300 grew, increasing in detail when I saw the underneath of a full-size replica at the the 2005 event (the best display ever, in front of Goodwood house; six Honda powered single seaters suspended in the sky, gently oscillating up and down). It was not until the 2008 event, that I realised the importance of the Lola T90 and made that vital mental connection and thereafter was able to visit Lola to see the car and thus improve my 1/12 scale effort. In 2007/8, I returned to the Honda enclave to find Y.I. had been moved on (in Honda’s quest to give each employee an experience in every division of the company) and now M.K. was Chief Engineer and my new inter-continental ally for the cause. He kindly helped further with more precious photos and then, rather suddenly when we were discussing details of the engine construction and materials used etc, all ties were cut when Honda pulled-out of Formula One racing in December 2008. However, I have been incredibly blessed with opportunities to work closely with some of the fantastically generous individuals who worked at the Honda Collection Hall, Motegi. I have to say that ‘sorting’ the RA300, using a Tamiya RA273 engine, limited access to RA300 and a T90 has been difficult to say the least. I have some suspicions that one or two of the dimensions are not quite right, but I can’t go back and check, unlike I have frequently done with a UK based racecar. I still have to contend with tyre issues, for the RA273 (Tamiya kit) used narrower Goodyears and the RA300, Firestones. My aim is to produce a model that is more than 95% correct dimensionally, that ‘looks’ right and shows all the engineering present on the restored car. As for period information (author Doug Nye is kindly helping), this is extremely limited and the photographs of the day reflect the general lack of interest in this particular car; afterall, it wasn’t a crowd-pulling Lotus, Brabham or Ferrari perhaps. Quality of photography back in 1967 was poorer in normal use and the light contrast on the day means that detail is frequently hidden by underexposed areas and faster low resolution print film. Whilst John Surtees knows of the quest, in 2009 I have been fortunate to correspond with Laurie B, one of the mechanics who built the RA300 back in 1967 and he had some stories to tell. Currently (Feb 2011) the model has been idle since autumn 2009 when I started work on the Tyrrell 006/2, after sending my reworked Honda V12 for resin casting. This engine is still not back in completed form and I want to finish the Tyrrell, so the RA300 will have to wait until near the end of this year (2012), before this particular automotive love affair can begin again. Project restarted in mid December 2012 and ran through to April 2013 when it was again railroaded into temporary retirement by other ‘good’ things – in January 2013 I was invited to speak at the British Racing Mechanics annual dinner at Brooklands sharing the podium in a double-act with Motor Sport’s Doug Nye. There, I showed the contents of a DVD of images that rolled through all my modelling work whilst Doug and I discussed ‘models’ and where they fit in with the real world, from the front. In April, I visited Gordon Murray Design and exhibited the main group of eight models and thereafter was captivated by a new concept, one of producing a Photo Book showcasing all my work from the beginning. This book entitled MRO F1 Engineering – the first twenty years, is described both in a recent post and also via Twitter with links to Photobox. Essentially, it is a high quality presentation of models alongside the many interactions they have generated within the real Formula One world. Working towards displaying the models for McLaren’s Employee Motor Show and also for their 50th anniversary celebrations in conjunction with the McLaren Old Boys and Girls reunion event in September, I worked tirelessly on another book exclusively showing the production of the McLaren M19C in 1/12 scale (also introduced within a post on the homepage and via Twitter), therefore the work on the Honda RA300 had to wait until late September 2013. On resuming work, more material has since been put on Twitter (simply click the icon on the home page and then view the Tweets or just the photos). A friend just sent me a 1/32 scale model of this car (slot car), and, it looks a little large in height and width. Do you have the dimension of the width of the main tub at it’s widest, and the hight of the tub at it’s tallest (over cockpit sides)? Also, the length of the monocoque from the tip of the nose to the pointy part where the engine subframe joins it.